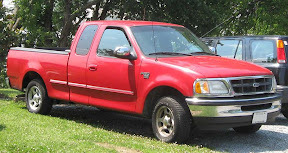 The National Highway Traffic Safety Administration is investing a possible defect in Ford F-150 pickups from 1997 to 2001. Image from Wikimedia Commons. Problems with the fuel tank straps on 1997 to 2001 Ford F-150 trucks have prompted the National Highway Traffic Safety Administration to investigate the matter. Straps that secure the tank to the body can rust, and the tank can end up being dragged under the vehicle and possibly setting fire to the fuel. No recall has been announced yet. The National Highway Traffic Safety Administration is in the midst of investigating a possibly recurring defect in Ford F-150 pickup trucks from the late 1990s and early 2000s. The defect is in the fuel tank straps, the metal bands that hold the fuel tank to the body, according to Reuters. The investigation has expanded to 2.7 million possibly affected vehicles, F-150 trucks of model years 1997 to 2001. The NHTSA initially began looking into the matter in September after receiving complaints, but since the NHTSA has learned of more accidents, it is expanding the investigation. The fuel straps can rust and possibly break, leading to the fuel tank being dragged under the vehicle, according to the Los Angeles Times. As a result, sparks can ignite the fuel. The NHTSA has documented 306 complaints, of which 156 were directly to Ford and 175 were made to the NHTSA. The rest were complaints lodged with both Ford and the NHTSA. The investigation began after 32 complaints had been made by September of last year. Investigations by the NHTSA into a possible defect often lead to recalls. There have been 243 cases involving the fuel tank straps giving way and being dragged on the ground. Ninety-five of those cases involved fuel leaking. Only two instances have been recorded of a vehicle catching fire, and in one the vehicle was destroyed. Ford is also dealing with a recall related to the airbags in the F-150 in trucks made between 2004 and 2006. There were 269 incidents of accidental airbag deployment, according to the Los Angeles Times, and nearly a third resulted in injuries. Ninety-eight people have been injured by airbags going off for no reason, some resulting in permanent vision damage, chipped teeth and various neck and back injuries. Ford initially believed the defect was only in F-150 trucks made in Norfolk, Va., but later expanded the recall to trucks made in Dearborn, Mich., and Kansas City, Mo. The Lincoln Mark LT is also affected. Ford has recalled nearly 1.2 million vehicles as a result of the airbag problem. The defect is caused by an improperly placed wire that can wear away the insulation and expose the copper, resulting in a short circuit and discharge of the air bags.